Regular numbers? Those are for amateurs. Show off your mathematical prowess with a watch that features the equivalent notation of each number. 1 - Legendre's constant is a mathematical constant occurring in a formula conjectured by Adrien-Marie Legendre to capture the asymptotic behavior of the prime-counting function. Its value is now known to be exactly 1. 2 - A joke in the math world: An infinite number of mathematicians walk into a bar. The first one orders a beer. The second orders half a beer. The third, a quarter of a beer. The bartender says, "You're all idiots," and pours two beers. 3 - A unicode character XML "numeric character reference." 4 - Modular arithmetic, also known as clock arithmetic, is a system of arithmetic for integers, where numbers "wrap around" after they reach a certain value. The modular multiplicative inverse of 2 (mod 7) is the integer /a/ such that 2*/a/ is congruent to 1 modulo 7. 5 - The Golden Mean...reworked a little. 7 - A repeating decimal that is proven to be exactly equal to 7 with Cauchy's Convergence Test. 8 - Graphical representation of binary code. 9 - An example of a base-4 number, which uses the digits 0, 1, 2 and 3 to represent any real number. 11 A hexadecimal, or base-16, number. Made in China. Standard watch battery included. This watch is not water-proof. This was a graduation gift for my nephew who will be majoring in Mathematics in college in the fall. The minute he saw it he loved it. He was excited to figure out how to solve each problem/equation. This is definitely a unique gift that was perfect for him. The Watch for Wizards and Wise Men!! This is an unusual gift. Since we got it she has had a number of comments all positive and questions on where to purchase. Even her math teacher asked where she got it and said he was going to check out the site so he could get one. Very original and functional too. Playful and informative. Definately Tech wear and a Geek Wanted item. Keep it in your arsenal of great items!!! Well DOne Uncommon goods!!! I will most likely wear this as a conversation starter at nerdy events, or just display it in my house somewhere when it's not used. I just think it's a fantastic idea and love looking at it. Bought this as part of a graduation gift for my daugter. It's the perfect nerdy gift! Great gift for math lovers! I bought this for my husband, who is an engineer (and quite frankly, a total geek) for his birthday last year and he absolutely loved it. It was a fun gift and he had a good time figuring out what all the numbers are, etc. I will say that the watch was smaller than I expected -- it is definitely a unisex watch. My husband is a big guy and he has to use the last hole on the strap and even at that, the watch barely fits. He really likes it, though, and the band really makes it unique. Unfortunately, the band broke some time ago, but after contacting customer service, they really went above and beyond to get us a replacement. I was beyond pleased with their service and promptness. We had a new watch within days. I bought this watch as a graduation gift for my son who is in his senior year of Petroleum Eng. at Univ. of Tulsa. I knew he would love it, so. needless to say I couldn't wait and gave it to him early. He absolutely loved the watch. It's so unique and such a great reminder of all the math courses he has taken. When the watch arrived, my husband told me he wanted it if our son didn't like it! Guess I need to order another one! My hubs was so excited to see this unique, conversation starter watch. His minor in college was mathematics. This watch was in line with his tech/geek personality. He loves his watch! attractive, yet nerdy, all in one! We love the watch. Very clever. Very attractive. But, we needed a gift for a manly man. The watch is smaller and more delicate than we expected -- perfect for a geek woman, but not so much for our big, strong man. 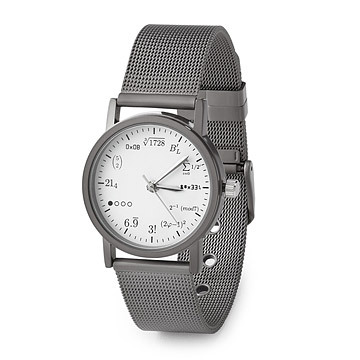 Show off your mathematical prowess with a watch that features the equivalent notation of each number.